Since being back in California, I’ve actually been craving Italian food! After all, I have been living in Florence for almost four years and I’m used to eating pasta three to four times a week or even more! Now SPQR, a one Michelin star restaurant in San Francisco, isn’t exactly the type of Italian food I might be eating back in Italy. I’ve been to a good amount of fine dining Italian restaurants in Italy and they have all been outstanding. Even though these fine dining Italian restaurants serve modern Italian cuisine, they still tend to have an overall traditional Italian flavor profile when it comes to their dishes. Since I am a California girl after all, I tend to prefer my modern Italian food with guess what?…a Californian twist and that’s exactly what SPQR does so well. SPQR offers quite a large menu mainly emphasizing on antipasti (appetizers), primi (rice and pasta dishes), and just a few secondi (main courses). We ordered antipasti and primi dishes which we shared family style. 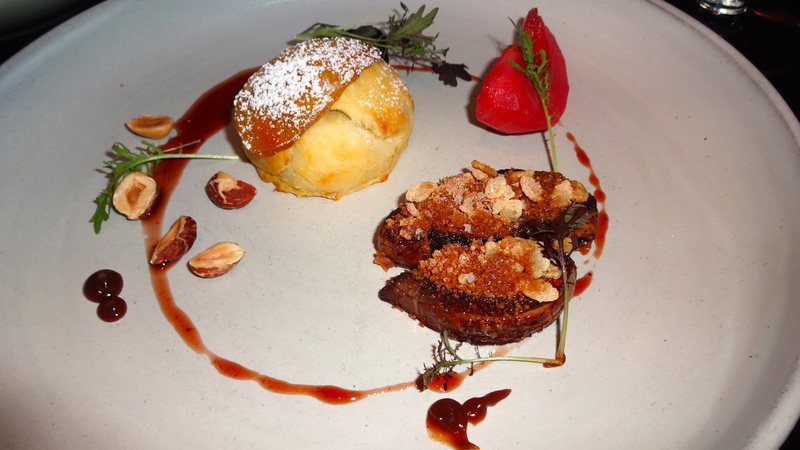 Foie Gras with Plum stuffed Onion Bun, Hazelnuts, and Hibiscus Apple (9/10). 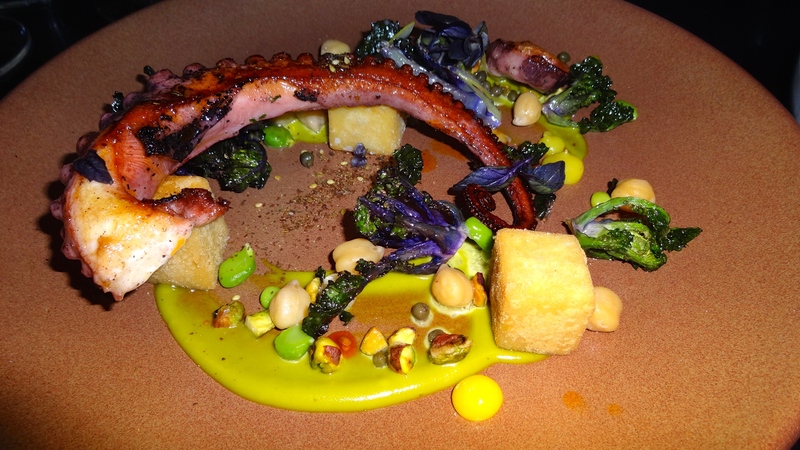 Octopus with Kale, Panissa, Chickpea, Opal Basil, Pistachio, and Preserved Lemon (8.5/10). 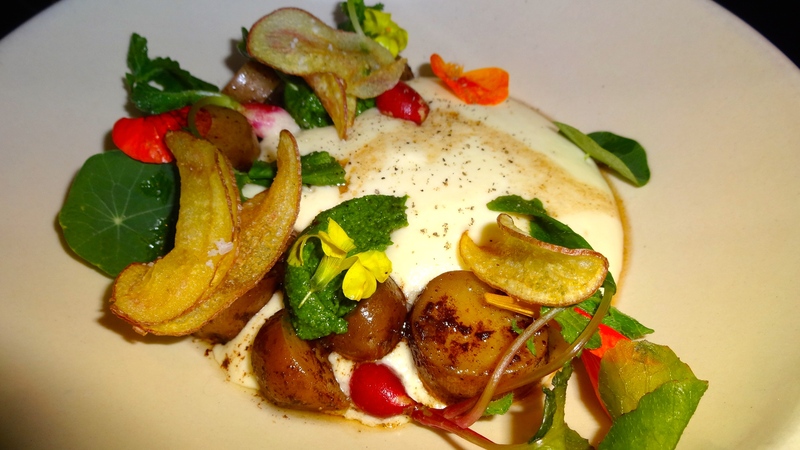 Warm Heirloom Potato Salad with Nasturtium Pesto, Brown Butter, Comté Cheese, and Red Radish (8/10). 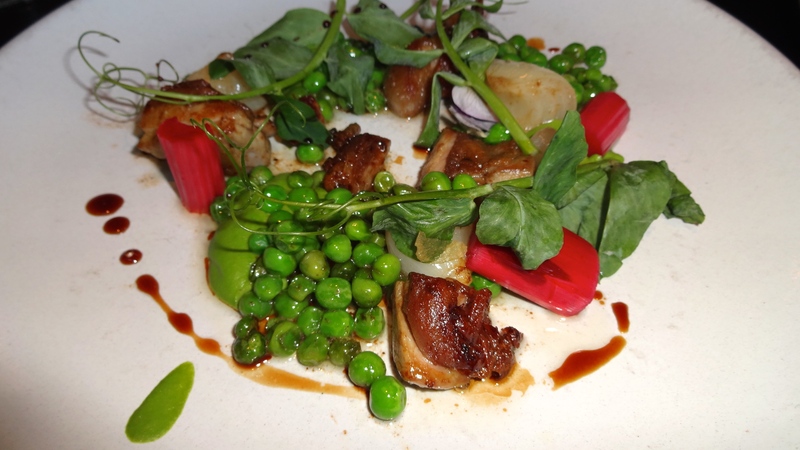 Duck Confitura with English Pea, Rhubarb, Baby Onion, and Saba (8.5/10). 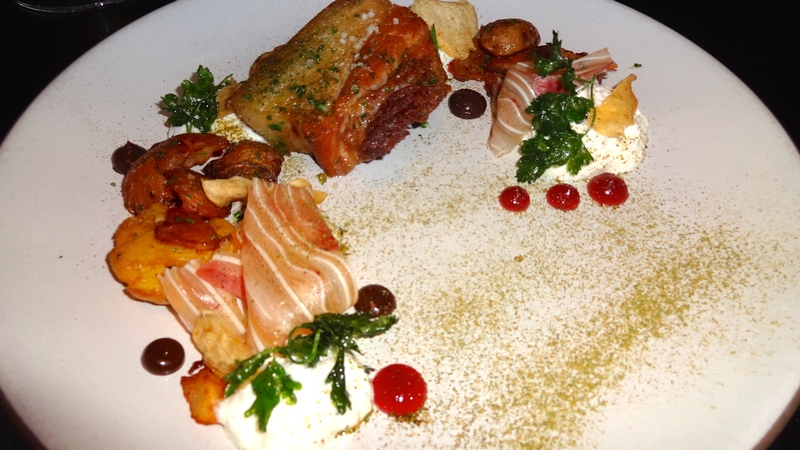 Pig Ear and Pork Belly with Fried Potatoes, Goat Cheese, Black Garlic, Gremolata, and Pomegranate (8-8.5/10). 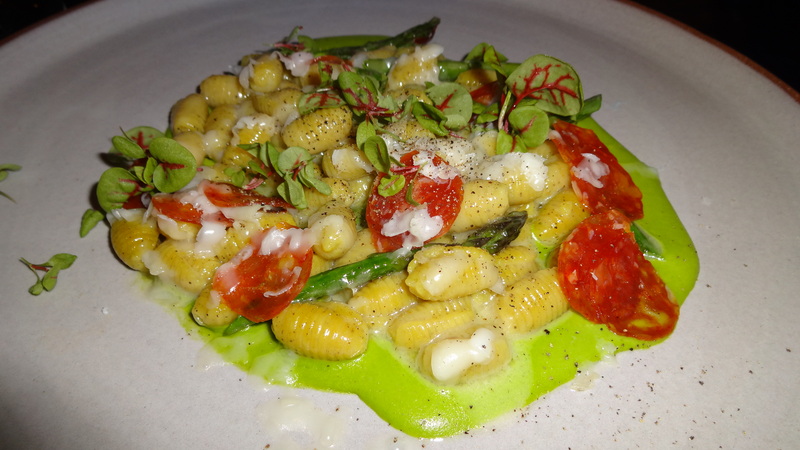 Gnocchetti Sardi “Cacio e Pepe” with Asparagus, La Querica Salumi, and Capriago Cheese (8/10). 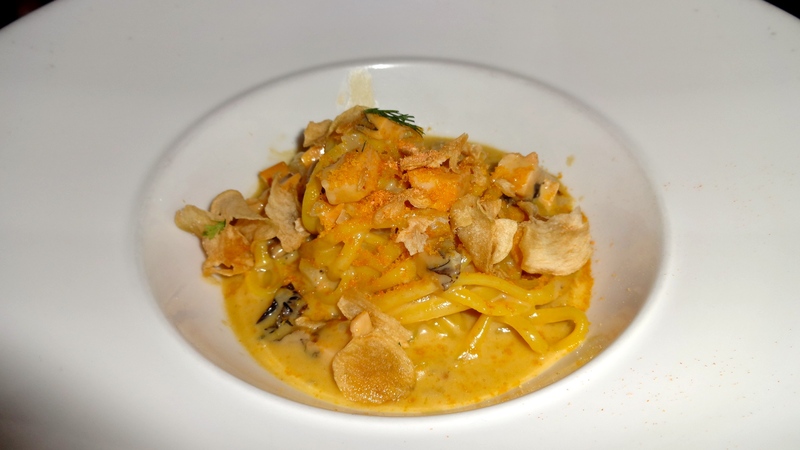 Meyer Lemon Linguini with Abalone, American Bottarga, and Garlic Chips (8.5-9/10). 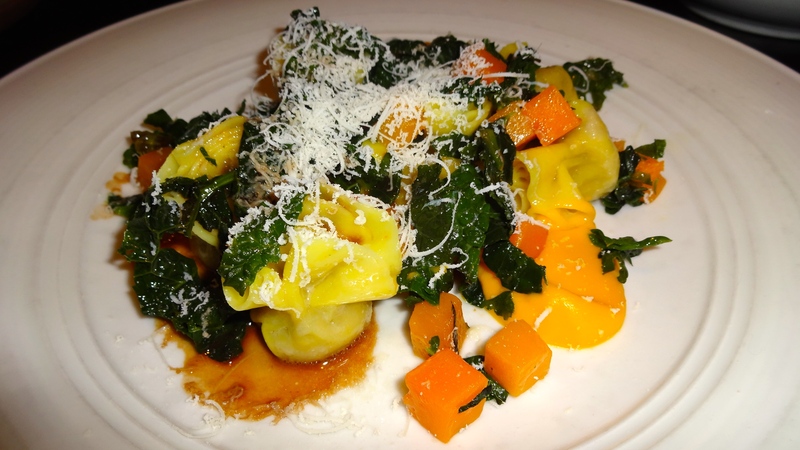 Short Rib Sacchetti with Butternut Squash, Tuscan Kale, and Ricotta Salata Cheese (8.5/10). Charred Onion Perciatelli with Creamed Leeks, Guanciale, Ricotta Salata Cheese, and Onion Ash (9/10). 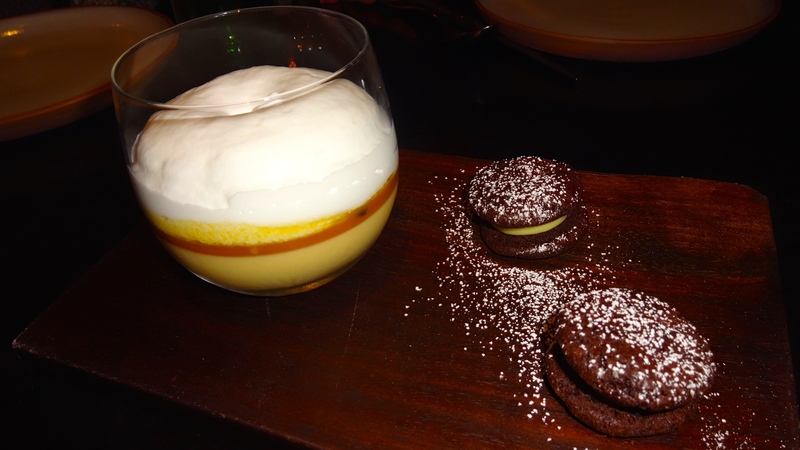 Passionfruit Panna Cotta with Caramel and Coconut Spuma with Chocolate Passionfruit Sandwich (8/10). 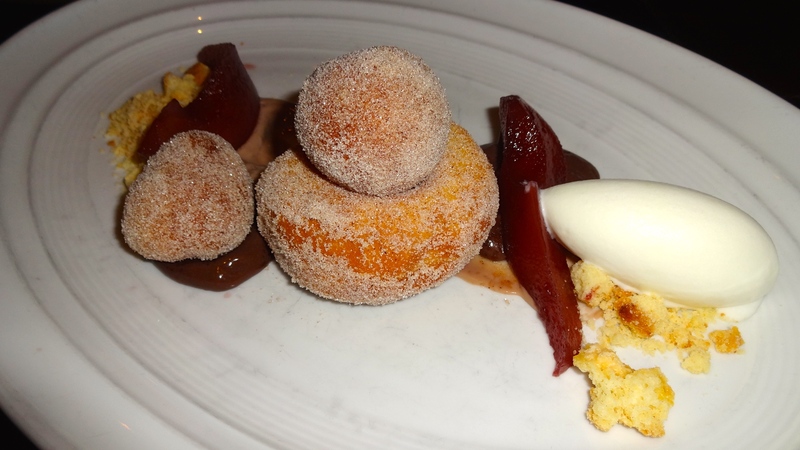 Cinnamon Bomboloni with Red Wine Pear, Chocolate, and “Fior di Latte” Gelato (9/10). 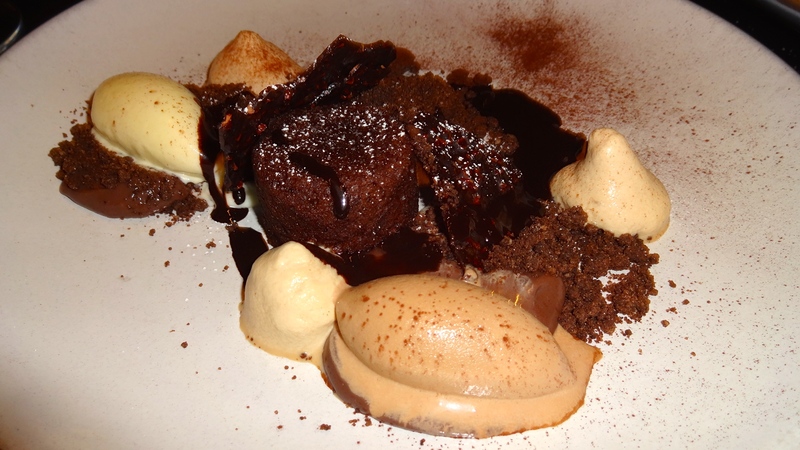 Coffee and Chocolate with White Coffee Gelato, Liquid Center Cake, Spuma, and Cocoa Nibs (8.5/10). 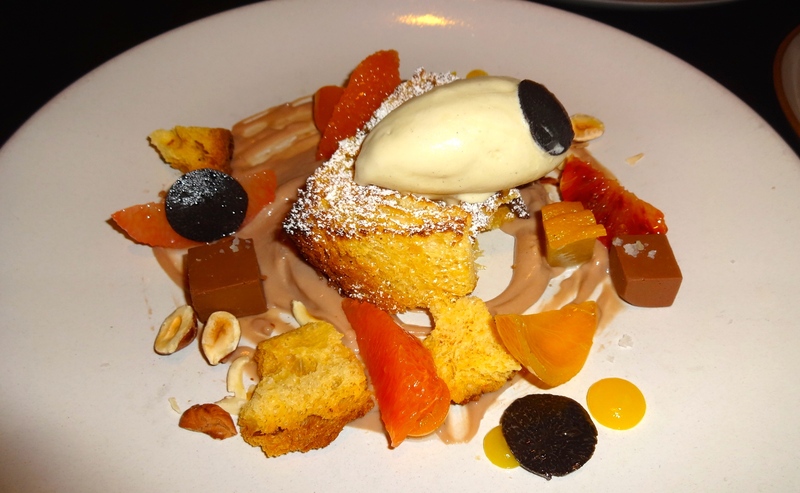 “Panettone” with Winter Citrus, Hazelnut, and Black Truffle Gelato (8/10). SPQR might be one of my top meals since being back in the Bay Area; I thoroughly enjoyed every single dish that we ordered. Each dish was beautifully crafted in presentation and tasted absolutely divine. Highlights of the meal were the foie gras, duck confitura, linguine with abalone, charred onion perciatelli, and the cinnamon bomboloni. 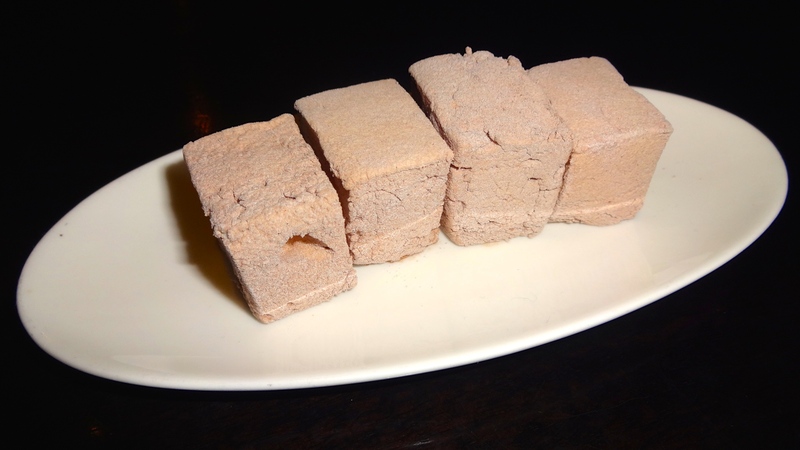 The foie gras (duck liver), quickly pan-seared and encrusted with a hazelnut topping, was excellent with the fluffy light onion bun which was stuffed with a sweet plum compote. The duck confitura had tender moist meat and paired beautifully with bright sweet english peas, tart rhubarb, and sweet yet tangy saba (syrup made from grape must). 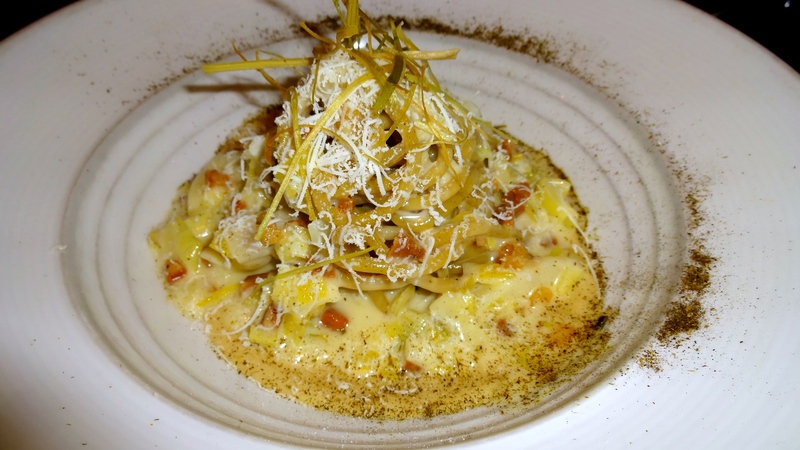 The abalone linguine tossed in a tart meyer lemon cream topped with bottarga (fish roe) and fried sweet garlic chips was scrumptious. Abalone, essentially sea snails, are naturally slightly tough but the chefs at SPQR did a fantastic job of making them as tender as possible. The charred onion perciatelli was a modern take of an Italian classic, pasta alla carbonara. Long strands of pasta tossed in a creamy sauce of leeks and crispy guanciale (cured pork jowl) topped with Ricotta Salata cheese and a sprinkle of onion ash. Delicious! Now onto the sweet stuff, desserts. One of the more creative and interesting desserts we tried was the panettone with black truffle gelato. First, panettone is a classic Italian cake only eaten during Christmas time and is flavored with raisins and candied citrus. They did a deconstructed version of panettone with a light airy cake with segments of succulent juicy winter citrus and raisin “fruit leather” topped with black truffle gelato, a gelato that had nuances of earthy black truffle. Now my favorite dessert was the cinnamon bomboloni or Italian style donuts. These donuts, fluffy and airy tossed in sugar, were paired with red wine pears and creamy yet light fior di latte gelato, “milk” gelato. SPQR is truly an outstanding restaurant serving creative and modern Italian cuisine with a Californian influence. The food served here was superb so I would have to rate them at a 8.5-9/10. I would highly recommend SPQR for foodies looking for innovate takes on Italian cuisine in a comfortable casual atmosphere.